Easy Cheesy Pizza Bake = winner, winner chicken (pizza?) dinner. I love making meals completely from scratch, but let’s face it. When I only have 30 minutes to squeeze in a family dinner somewhere between homework, karate, school events, and bedtime, I’ll take any shortcut I can get. We need quick and easy on the weeknights. Plus, the meal has to be something that will please not only my carnivore husband, but one that my 6-year old will actually eat. Pizza usually fits the bill. I almost always have a roll of Pillsbury Crescent Roll dough in my refrigerator. It’s so versatile – I roll it out flat to make a quick pizza dough; wrap it around hot dogs for Doodle (‘mummy” dogs are always a kid-pleaser); use it for quick cinnamon rolls; or just roll ’em the standard way, topped with mozzarella, Parmesan and Italian spices for a quick accompaniment to spaghetti and meatballs. As a bonus for me (always watching the waist-line, you know), they even come in reduced-fat. This easy cheesy pizza bake came together in a flash, and we pretty much scraped the pan clean by the end of dinner. Doodle even asked for seconds – that never happens at my house! I used ground turkey sausage as the base for this bake, but you could certainly substitute ground beef, chicken, turkey, or even soy crumbles. Whatever floats your boat! To the cooked meat, I stirred in a homemade (but quick!) pizza sauce and let it simmer for just a few minutes. We piled it in a pie plate lined with crescent rolls, added in some cheese, and baked it for 15 to 20 minutes. Dinner in under 30 minutes that the whole family will love? Done and done. What’s your favorite way to use crescent rolls? This pizza bake is a new family favorite at my house, and I’m already thinking up new flavor combinations! In a large skillet, brown the turkey sausage. Drain meat and add back into pan. Add the minced garlic and saute for 2 to 3 minutes. Add the tomato paste, water and seasonings into the meat mixture, stirring to combine. If desired, stir in a can of sliced mushrooms and a can of sliced olives - or your other favorite pizza toppings. Separate the crescent dough into 8 triangles. Place dough into an ungreased 9-inch pie plate in a spoke pattern, allowing the narrow tips to overlap the rim of the plate about 3 inches. Press dough on the sides and the bottom of the plate to form a crust. Sprinkle 1 cup of the cheese in the bottom of the pie plate. Spread meat mixture over the top. Fold the dough over the filling and bring tips to meet in the center. Sprinkle with remaining ½ cup of cheese, and if desired, ¼ teaspoon dried basil and remaining olives. Bake at 375 for 15 to 20 minutes, or until dough is golden brown and the cheese is melted. 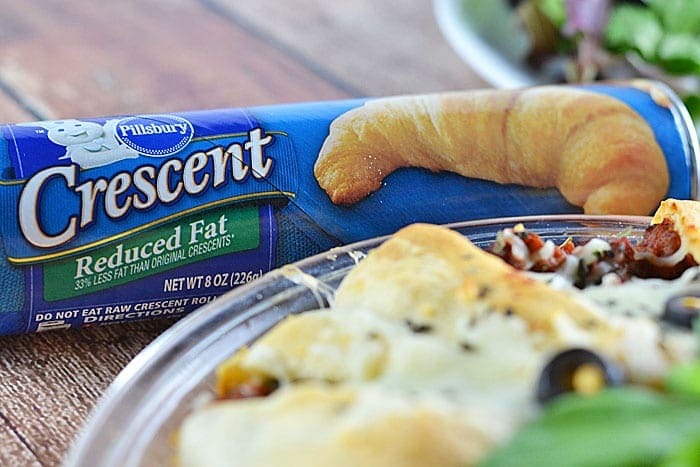 Want a winning weeknight dinner the family will enjoy – make Pillsbury Crescent Rolls. Get Recipes at www.Pillsbury.com. This is also great to take to a potluck. I have to make this! It’s definitely a crowd pleaser! I hope you like it! 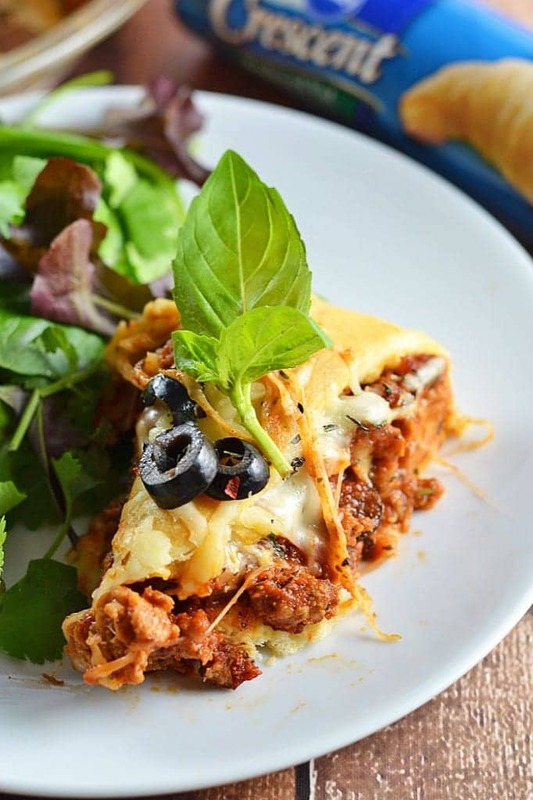 This looks like a quick but delicious dinner any night of the week! Thanks, Nicole. We definitely enjoyed it, and it was so easy (my fave!). Oh I am all over this pizza ring! Looks Great!!! Crescent rolls are the best things ever!! 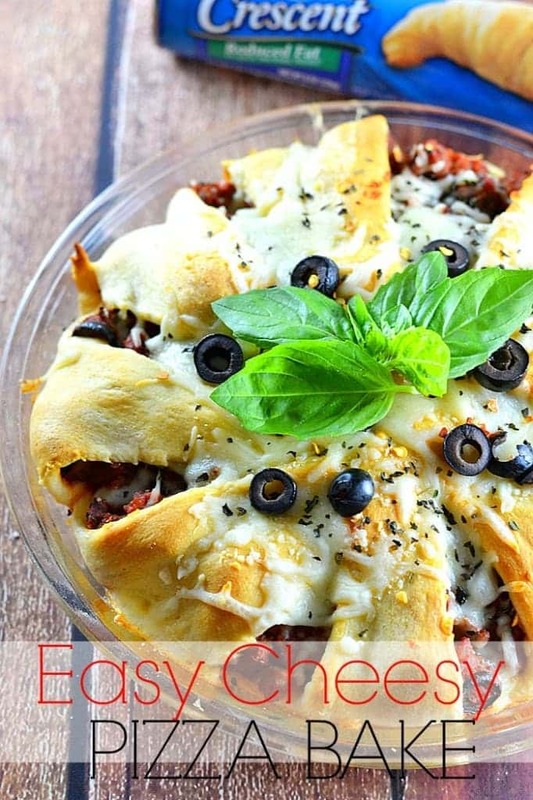 This pizza bake…OMG Ashley! This looks so yummy! I think my family needs to have this for dinner very soon. Have pinned! The spices were REALLY overwhelming. Maybe it wasn’t supposed to be two TABLEspoons of the Italian seasoning? Way less spices, and this would be super tasty.